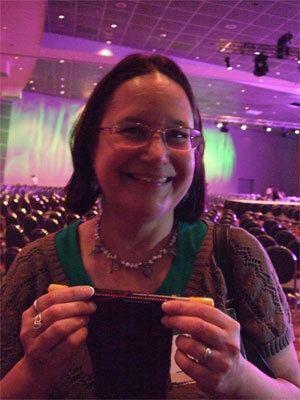 There was a knitter who lived in Toronto who went far away on an airplane to a magical place called Columbus, Ohio, where there was a gathering of special people called TNNA. 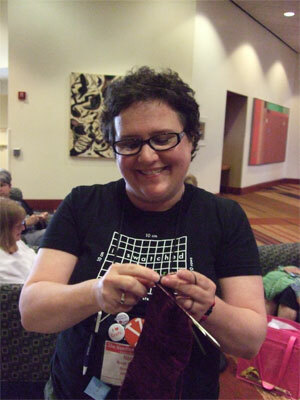 The knitter had heard that TNNA was a special thing, but she had only been to TNNA one time before, and it was only for four hours and while the knitter hadn’t really disliked the thing, she hadn’t had time to understand what was going on either. This time though, this time the knitter was going to the magic forest TNNA for 60 whole hours, which is almost longer than this knitter has spent in one place in months and months. She was very excited about the idea of sleeping in the same bed for a whole three nights in a row. Anything more than that was just going to be gravy. She arrived in the magic land and right away she got to see some of her special friends that live far away in their own kingdoms. They went to a feasting place with the best BBQ tofu ever, and the knitter looked at her friends over dinner and realized that something special was happening. 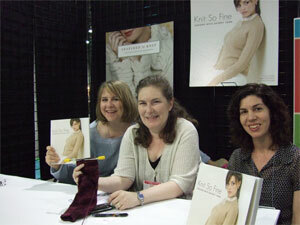 The knitter and her friends (Queen Clara of Knitters Review. and the sorceress Cat Bordhi) were talking about SSKs and no person around was trying to escape their circle of yarn or yawning, or even making jokes about how odd it was that three bright women could care this much about how loops of string looked and behaved. 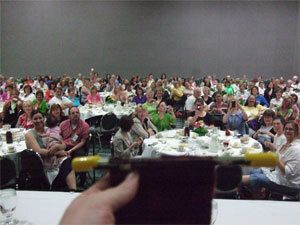 The knitter began to understand the magic of TNNA. The next morning when the sun dawned over the fortress of light and hope known as the Columbus Convention Centre, the knitter went forth to investigate this place… and this is what she found. 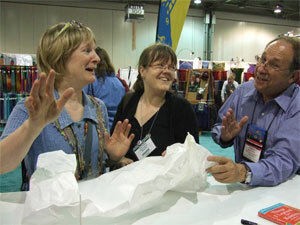 Many, many powerful people known as “Yarn Retailers”. 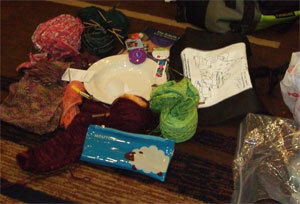 but also because there was no one around the knitter (except maybe the bartender) who did not like yarn. 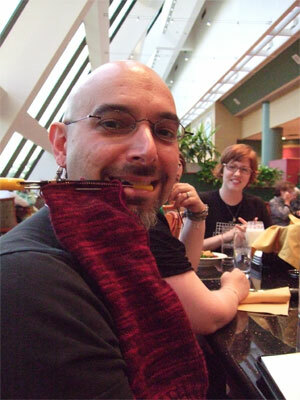 No one who thought knitting was silly. 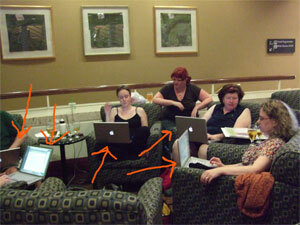 No one who did not know that it is a Billion dollar industry. 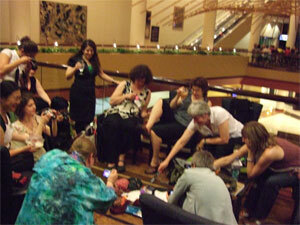 In fact, and here’s something else that the knitter found delightful, everyone WANTED to hold a sock. 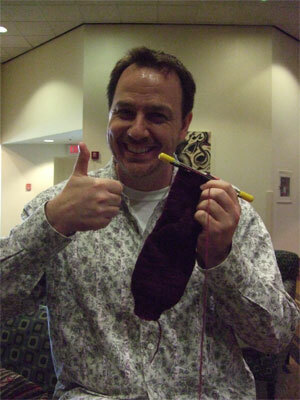 Nobody wondered about the sock, nobody wondered why the knitter would ask them to hold a sock. 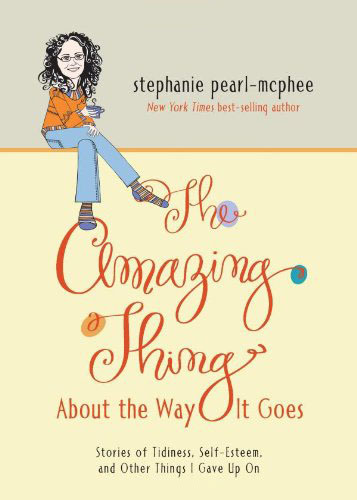 She saw Casey and Jess and Mary Heather, who have a mystic company called Ravelry that is so deeply under a spell that even though many, many thousands of people fit in it… no one has ever found where it is. 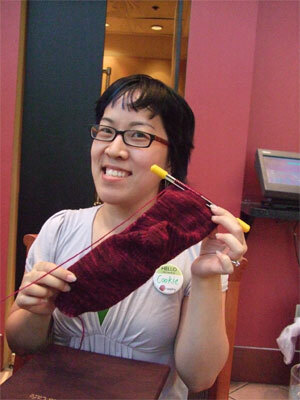 Casey claims that the whole company (even though it has more knitters in it than anywhere else) has been enchanted to miniscule size so that it fits in a “server”. He is indeed powerful and strange. 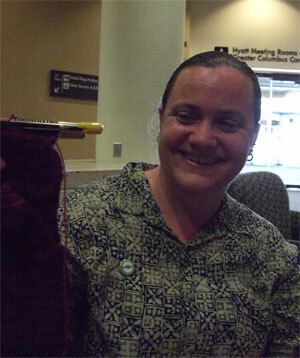 Sandi from Knitting Daily held the sock. 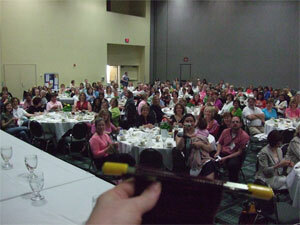 Norah Gaughan held the sock and the sock just about lost its mind. 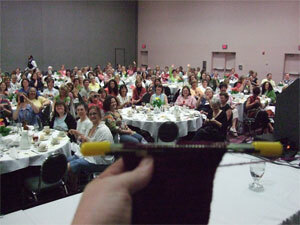 The Knit So Fine ladies held the sock. 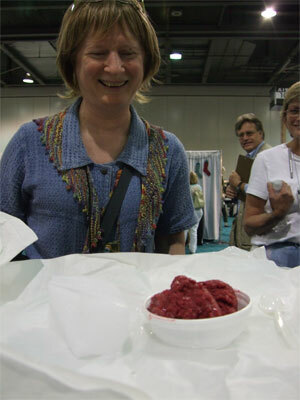 At TNNA, there is a magic food called Jeni’s ice cream. 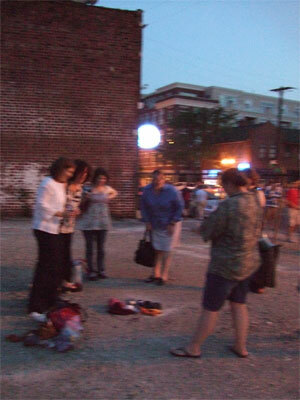 It is legendary, and most of the attendee’s stalk it at various intervals in their day so that they may imbibe as much of it as possible before returning to their Jeni-less existence. 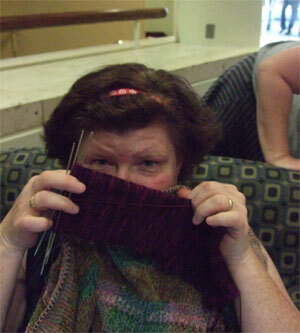 (There are some knitters who have it shipped to them. It does not ship to the land of Canada. I checked.) 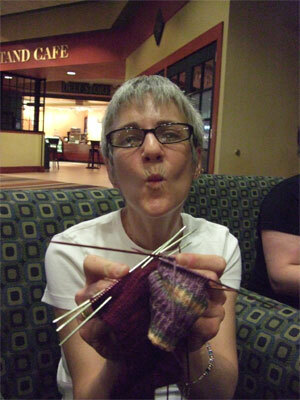 While the knitter was there, she tried to try all of them but there are limits. She tried (by both purchasing full servings and stealing from others) Salty Caramel, Gravel Road, Belgian Milk Chocolate and one other one. (Nearing an ice cream coma, her memory fails her.) While the knitter was enjoying some sunshine on Saturday afternoon the sorceress Cat Bordhi revealed that in her opinion, the knitter had not yet eaten the best of Jeni’s. “Trust me” said the sorceress, and off she set. 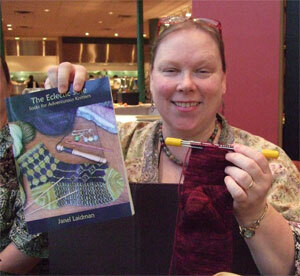 The knitter went to her booksigning then at Unicorn Books (It’s actually called that. I didn’t just name it that for the story) and she signed books for the retailers for an hour, and at the end of the hour, when it was 4:45 and Jeni’s closed at 5:00, the sorceress appeared. “Behold” she said, and she revealed the bright, beautiful and still totally frozen Cherry Lambic. Why was it still frozen? How had the sorceress kept it cool? 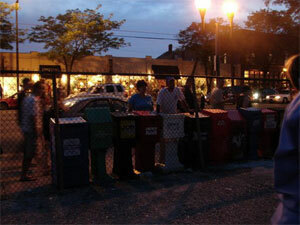 What spell keeps ice cream cold in Columbus in June? It was a mystic thing. A magical object procured by the sorceress Bordhi through her incredible powers of persuasion. 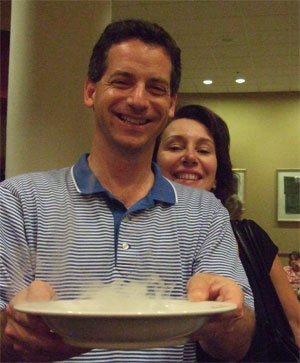 Somehow, someway, The Bordhi had convinced the ice cream shop to give her a piece of DRY ICE. 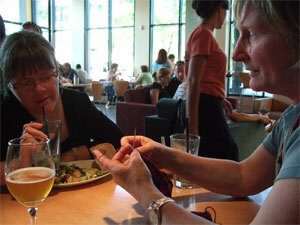 The knitter (and some other people, including the skeptic above) did then eat the magic Cherry Lambic (which was so totally one of the best things in the entire world and if you are reading this and you are still in Columbus then you should go get it right now) and then the Sorceress Bordhi wrapped up the DRY ICE and gave it to the knitter, and departed for parts unknown. 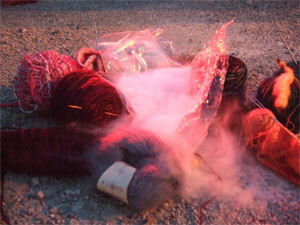 The knitter stared at her bag for a while, remembered what the sorceress had said about disposing of it safely (which was precious little) remembered that she was leaving in the morning and totally wasn’t going to get dry ice past airport security, and hatched a little plan. She went out to dinner with friends, they drank beer together and then on the way home, as they walked through the magical streets of Columbus, they looked for a good spot. They found an empty parking lot, and they got out the dry ice. 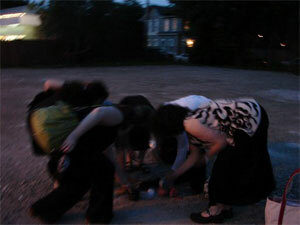 and then the knitters poured water upon it, and all took pictures while ordinary people stopped and watched, trying to imagine exactly what sort of street art was going on. 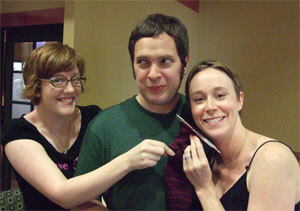 (Some pictures stolen (with thanks) from Mary and Molly Ann at Ariadne) The knitters were honest. They did not know what they were creating. They did know, however, that you can only put a piece of dry ice smaller than a golf ball in a toilet, so that idea was shot. 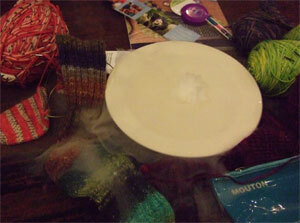 When full darkness came, they called the sorceress Bordhi and sang “Smoke on the Knitting” to her, picked up the still-bigger-than-a-golf-ball and returned to the lobby of the hotel, where a bowl was procured, and the magic circle of knitting stuff with dry ice continued. Finally, as the last dying wisps of dry ice were fading, Steve, Captain of the good ship WEBS, held it’s last gasps, on account of it was his 40th Birthday, and it just seemed right. 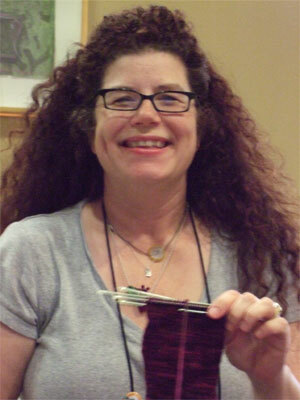 Then the knitter left the magic land of TNNA and returned home to the place of dirty laundry and a hostile cat… although she does have more yarn now than when she left. Go figure.